I've had these balms for quite a while but as you can see I really only use one! It was actually the first one I'd purchased, and probably my favourite lip balm/stain ever; Sultry. 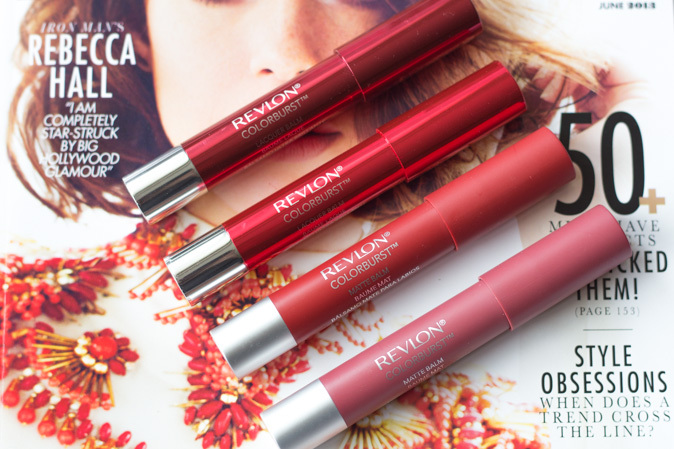 These Revlon Colorburst Balms are available in a variety of colours, and 2 different formulas. Lacquer and Matte. My personal favourite are the matte balms because of the higher pigmentation they give my lips, but I am a fan of the entire line. Here I have 2 lacquer and 2 matte to share with you, 2 of which I have picked up myself and the other 2 that I have received from Revlon. Both the lacquer and matte balms claim to be moisture rich and come in 10 different colours each, a total of 20 different colours for these balms! This gives you a ton of options in 2 finishes.. there is bound to be something that will be suitable for you and your lips. They both also contain a triple butter complex of shea, coconut, and mango butter to nourish the lips. 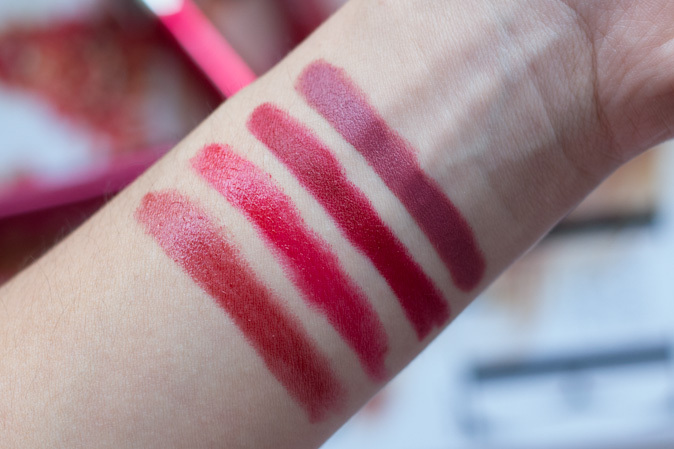 All of the shades I have are pretty much variations of red: Lacquer in Enticing, Lacquer in Provocateur, Matte in Standout, and Matte in Sultry. The balms come in a twist-up crayon type packaging, which I absolutely love because they are fun and easy to apply. There are only 2.7g or 0.095oz of product in them, which is about a third of the packaging *boo*. BUT it doesn't take much product to apply an even colour on your lips, so it might take longer than expected to finish a tube of one of these. The one thing I dislike about the twist-up packaging is that they are so easy to twist up, I'd hope that they don't end up twisting up in my bag and smooshing into the lid! (doubt that would happen, I'm over exaggerating) but you get the idea. The Matte Balms are my preferred type of balm because I don't like adding too much shine to my lips. 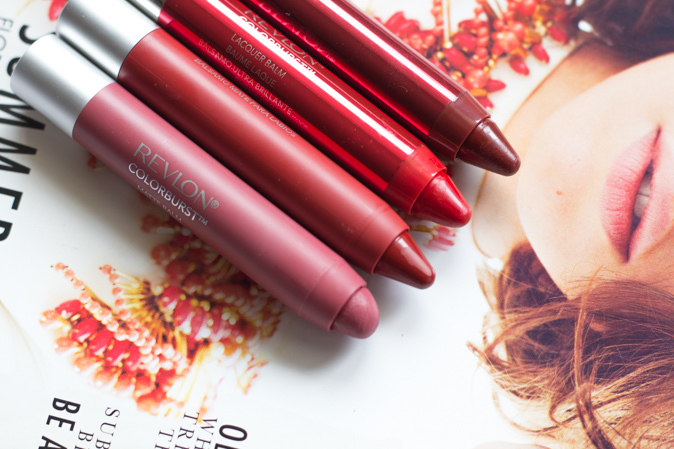 They glide smoothly onto the lips, and don't take much pressure at all to apply. I have been able to apply an even and very pigmented colour every time. The matte finish is perfect on my lips and looks very satiny. They are not overly drying, but I do prefer to apply a balm beforehand. They are cooling on the lips and smell minty, which I love because I hate that original lipstick smell (and taste). They stain well on my lips and I don't even feel like I have to apply throughout the day, even after eating and drinking. I would say they wear for the majority of the day. I couldn't give you an exact time but I usually apply it once and never again until the evening, only if really necessary! Of course there is a bit of fading, but it isn't overly noticeable. The Lacquer Balms don't stain well like the Matte, so you can't go all day without reapplying this one. They do not glide on just as smoothly as the Matte balms and the pigmentation is slightly lighter on the lips. The stain the lacquer balms leave is very subtle, unlike the deeper stain of the matte balms. These are also cooling on the lips and have a minty scent. 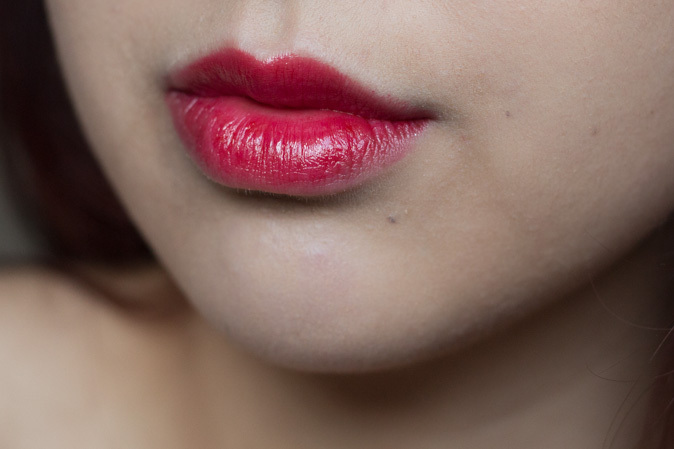 They have quite the shimmer to them and I try to avoid shimmer so I won't emphasize my already big lips. They would probably be ideal for someone who is looking for fuller and glossier lips. The minty feel that these balms give might make your lips feel dry, so I suggest using a balm beforehand and anytime throughout the day. Of course the colour will transfer onto a cup or napkin, but the matte was less likely to look like it had transferred off of my lips. Overall, I do not think they are very similar considering the higher shine but less pigmentation in the lacquer balms, and the stronger staining power in the matte balms. 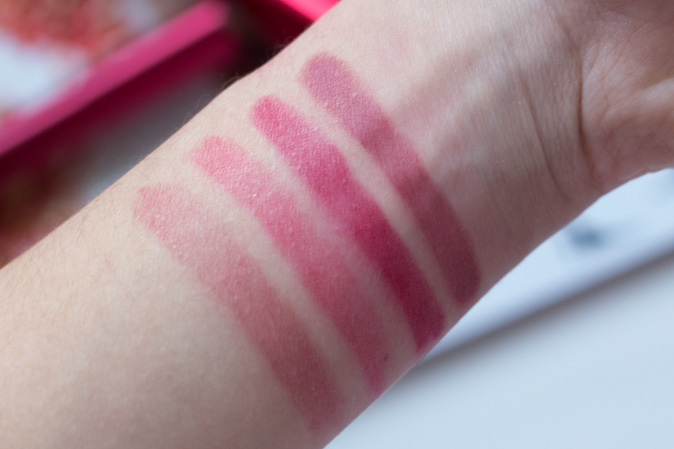 The first photo is swatched heavily and the second is the stain the balms leave when rubbed off with a tissue. 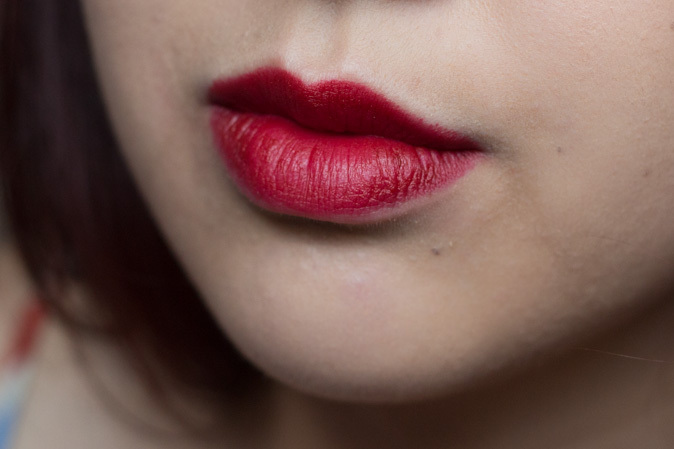 The matte balms had more of a stain and showed up stronger on the lips. Overall, I'd recommend trying out a colour in both formulas to see which one you like best, and is right for you. Personally, the matte balms are my favourite atm and will be buying some new shades, but likely will not in the lacquer formula just because of personal preference! 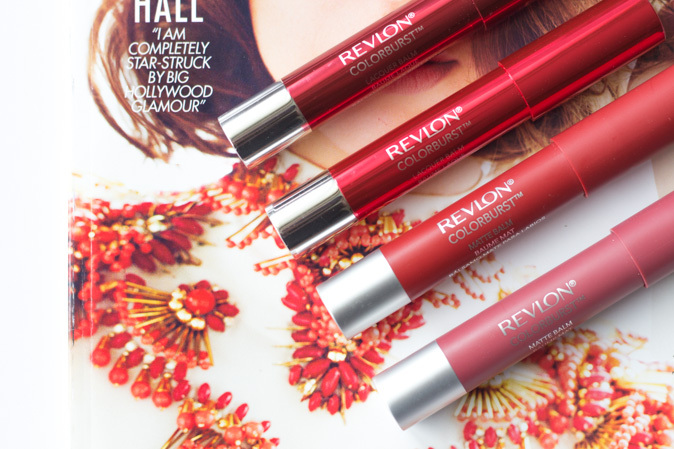 Have you tried the Revlon Colorburst Matte or Lacquer Balms? What did you think of them, or which ones are you looking to pick up? 2 of 4 of these balms were received for consideration. The other 2 were bought myself. All opinions stated are my own and are not influenced by any affiliates.